Tarte Holiday 2015 Sets, Kits and Palettes | Top Beauty Blog in the Philippines covering Makeup Reviews, Swatches, Skincare and More! Our long wait is finally over! 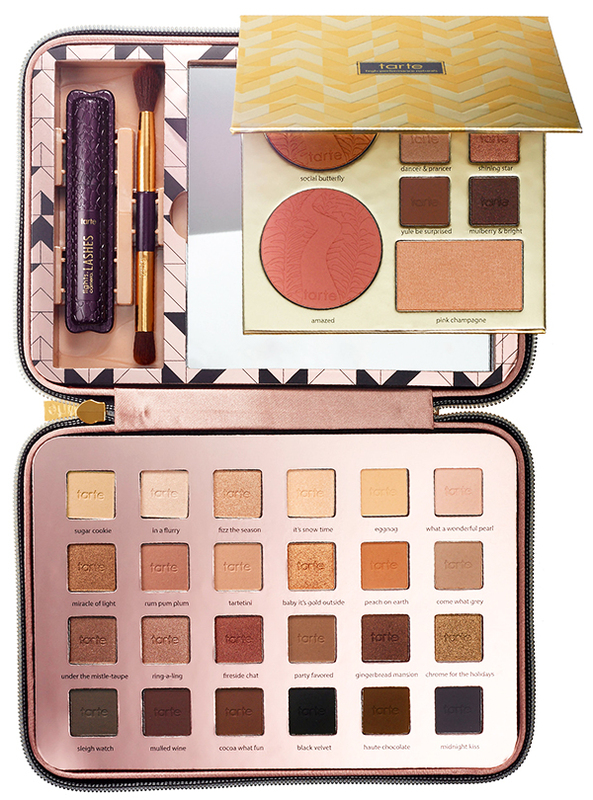 Tarte Cosmetics' holiday 2015 collection has finally arrived at Sephora. 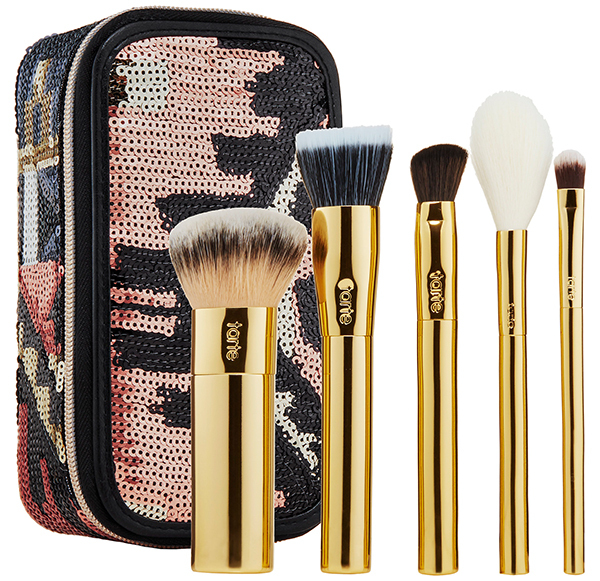 TARTE STROKE OF MIDNIGHT BRUSH SET $44.00 (limited edition / sephora exclusive) - Buff, primp, and create a glow with this chic collector’s set of high-performance tarte application tools. Dress up your vanity or give the gift of beauty tools with this set, encased in a sequined collector’s brush box. With a foundation, concealer, eye shadow, complexion, and blush brush, each one has a glamorous gold handle to celebrate the holidays, and this giftable brush box has extra room for your beauty must-haves so you can create a full face for every festive occasion. 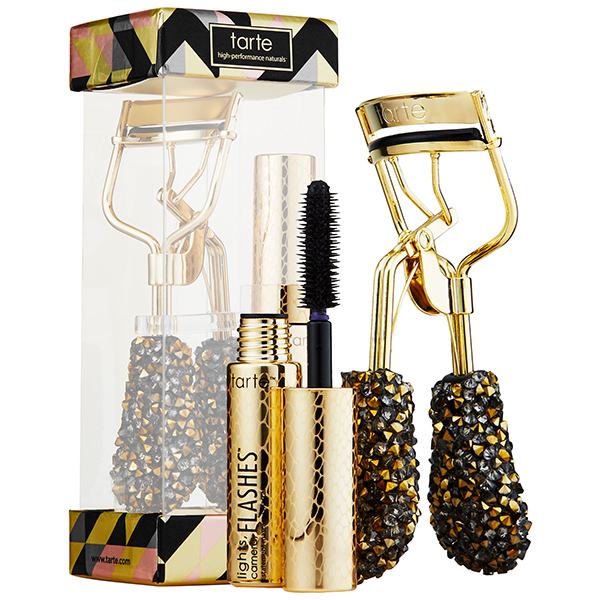 TARTE SHINE BRIGHT STATEMENT LASH ESSENTIALS $20.00 (limited edition / sephora exclusive) - Make a festive grand entrance with this this statement pair of limited-edition, lash-loving essentials. Take your lashes to new heights with the top-selling, limited-edition picture perfect eyelash curler all dressed up in a collector’s edition, holiday-inspired design with dazzling sequined handles. Its ergonomic shape has easy-grip handles and a soft, silicon pad that gently separates lashes, applying the perfect amount of pressure and curl without pinching or crimping. Finish off the look with two coats of the portable lights, camera, flashes statement mascara to instantly increase lash volume for a complete, party-perfect lash look. 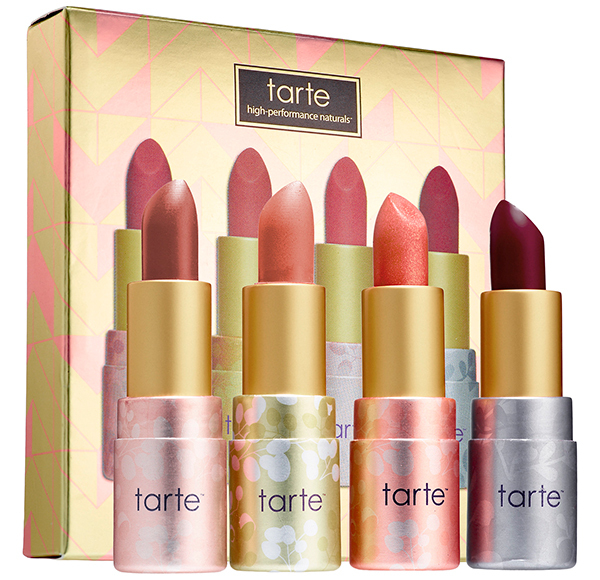 TARTE LIPS FOR DAZE LIPSURGENCE SET $34.00 (limited edition / sephora exclusive) - Create an array of lip looks with this giftable, full-size, collector’s set, featuring tarte’s iconic LipSurgence lip tints. With its three-in-one benefits of a lipstick, lip gloss, and a decadent balm, it delivers deep, hydrating pigment that lasts from beginning to end of any celebration. Experience five limited-edition lip tints that treat lips to full-coverage color in stunning matte and satin shades that are perfect for the season. 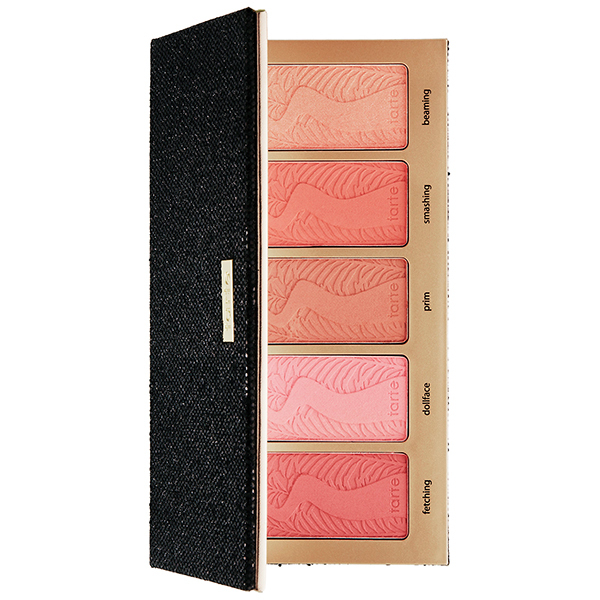 TARTE BLING IT ON AMAZONIAN CLAY BLUSH PALETTE $44.00 (limited edition / sephora exclusive) - This sleek, statement-making palette features five long-wearing, pigmented powder blushes. The full-size, flattering mix includes all-new stunners and blushing favorites powered by tarte’s iconic Amazonian clay, which helps to balance and replenish skin for better, longer, truer wear. Create a party-perfect flush or treat yourself to five limited-edition shades of this bestseller encased in an accessory-inspired palette designed to delight and dazzle through any festive adventure. 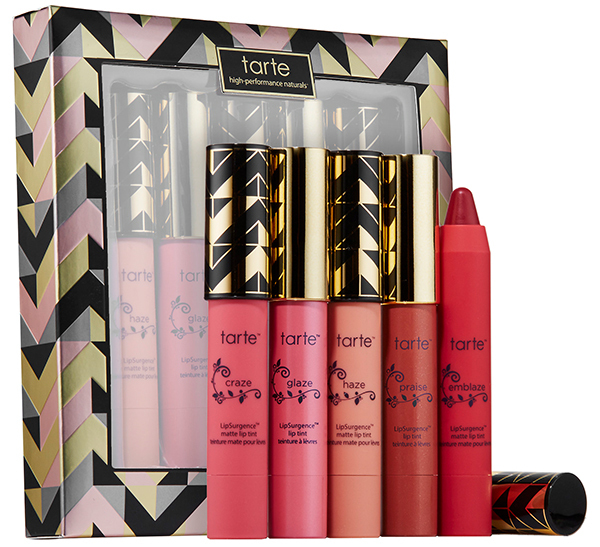 TARTE DELUXE AMAZONIAN BUTTER LIPSTICK SET $21.00 (limited edition / sephora exclusive) - Treat your lips to this adorable deluxe gift set, featuring tarte’s bestselling butter lipsticks. Their hydrating creamy, full-coverage formula is infused with Amazonian cupuacu and murumuru butters to deliver ultimate moisture as it smooths and softens dry winter lips. Packaged in a giftable box, these deluxe-sized lipsticks include four never-before-seen shades that are perfect for the holidays. TARTE LIGHT OF THE PARTY COLLECTOR'S MAKEUP CASE $59.00 (limited edition / sephora exclusive) - Be the center of the room with this festive, limited-edition collection, feautring tarte’s beauty favorites, designed to create smoldering makeup looks for any celebration. Create an eye-catching statement wherever you go with the travel-size takeaway palette, featuring shadow, cheek and contouring shades. The trendy collector’s case features a full-size, built-in eye shadow palette with 30 shades, including 24 brilliant, never before seen shades in mixed mattes and shimmers. With a travel-friendly eye shadow brush and deluxe-size mascara, this set is perfect for achieving seamless, on-the-go touch-ups for alluring, party-perfect looks. Those brushes are SOOOO gorgeous ! Omgosh I NEED those brushes. So luxurious! OMG! I like all the colors! Gorgous makeup! That eyelash curler is crazy pretty! Holiday collections are always the prettiest! Love this selection!